Introduction: nature is a language, 1. Planting a landscape: cultivation and reform in Ireland, 2. Planning a landscape I: cultivation as reformation, 3. Planning a landscape II: cultivation through plantation, 4. Inscribing a landscape: maps, surveys and records, 5. Material signs: ordering the built, 6. A civil offer: the failure to adopt English customs, 7. Bad manners, nasty habits: the elimination of Irish customs, Conclusion, Bibliography, Index. 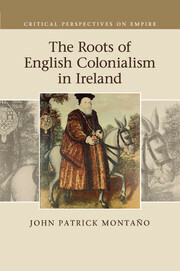 John Patrick Montaño is an Associate Professor of History at the University of Delaware.